“Paganism” is a blanket term covering a variety of nature-based religions and beliefs. Wicca, Druidry, Shamanism and Heathenry are just a few of the paths that fall under the broader definition of Paganism. For a more detailed explanation we like this article by Julia Phillips, who founded the Pagan Alliance in Australia in the 1990s, and this one by American witch Patti Wigington. I am new to Paganism. Where do I start? We suggest you read widely on areas that interest you. If you would like a starting point, check out our Suggested Reading page, and the articles on About Paganism and Wicca. What is the Pagan Collective of Victoria? How do I join the PCV? Membership to the PCV is open to anyone aged 18 or over. To read more about membership, or to sign up today, click here. The PCV is a community-based group. Its committee consists of a small group of passionate volunteers from many different traditions and locations. How can I contact the PCV? See our Contact page to get in touch with the committee. Mainstream Media, please take note: The PCV committee does not make comments or appearances in non-Pagan media. For media enquiries relating to Paganism in Australia, please contact the Pagan Awareness Network, inc. The best way to get to know us is to attend one of our social meetups. We run a number of café and pub moots in both urban and regional areas. See our Calendar for details. Are you passionate about community building or do you have a great idea that would benefit Victoria’s Pagan scene? To help out, or to have your say in the direction of the Collective, come along to one of our quarterly committee meetings. They are open to all PCV members. What events does the PCV run? We run a number of café and pub moots, dinners, public rituals, craft days, workshops and more in both urban and regional areas. See our Calendar for details. Some are and some (such as those hosted in licensed venues or late at night) aren’t. It’s best to check beforehand. Where can I find more information about a certain tradition/group/path? Our Suggested Reading section lists books and articles regarding many specific traditions, groups and paths. Public groups operating in Victoria are also listed in our Links section. Why doesn’t the PCV have an online discussion group? PCV’s focus is on face-to-face networking and community building across the state. There are literally thousands of online discussion groups dedicated to Paganism already, and we don’t feel a need to create another one. If you are looking for an online discussion group based in Victoria, we recommend the Witches of Victoria Facebook group. 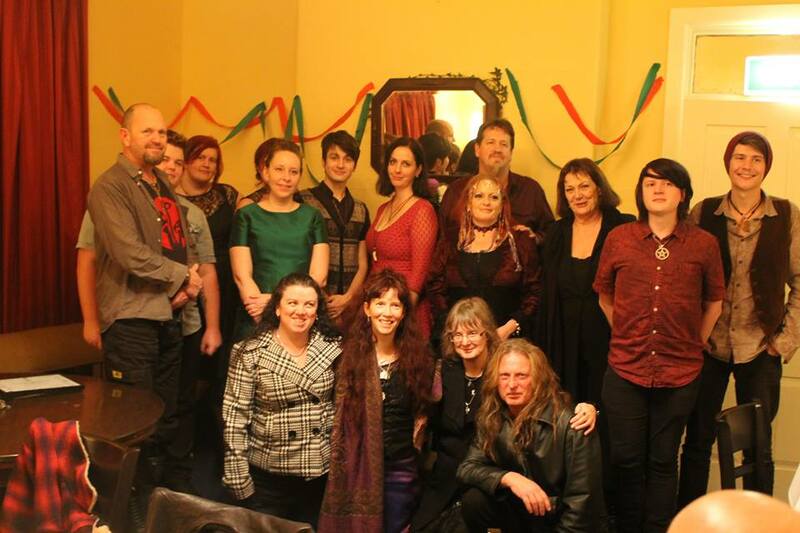 Attendees of the 2015 Yule Dinner. Photo by Mark.